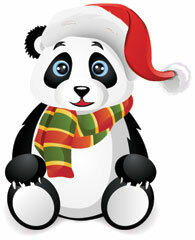 Google Panda Update: 3.2 - Minor Holiday Update? There is discussion and chatter at WebmasterWorld around a possible Panda update that started on December 19th. There is discussion around shifting of the search results and a top SEO at WebmasterWorld said "I wonder whether there has been a "Minor Panda update" since Dec 19, 2011." Many agree with him. Why an emphasis on "minor"? Google said last week there would be no major Panda updates until the new year. Like I said, several SEOs at WebmasterWorld strongly believe there was an update on December 19th. If that is the case, I believe we are up to version 3.2 of the Panda updates. Image credit to ShutterStock for holiday panda.